When my daughter was a child we lived on a remote island in the Atlantic only reached by boats and come every Saturday the island was a bride magnet. While her baby brothers napped we’d sit on the deck and watch the parade of brides go by via golf cart. She got apt at spotting the differences between a barefoot bride in a simple Vera Wang strapless for a beach ceremony versus a gal in cowboy boots and rhinestones that Dolly Parton would envy for a hoe-down reception at the clubhouse. Years go by and as teen she did much the same in jardin ten years ago enjoying what was then the start of SMA being the “It” city for the destination marriage market. She could point out to me when it was the wedding of a politician’s child or telenova star by the “hidden” security forces. She’d point out folks with no obvious connection in the jardin that spoke into watches and arranged the security forces for the upcoming wedding party. Silly me thought my daughter had a real future in security, instead she became a wedding photographer! These days I’ve had many a destination wedding party on my tours. They’ve run the gamut from elaborate and elegant affairs to the happy (and zany) couple insisting all attend the wedding with gifts purchased from the Tuesday Market. This led to a fascinating chat with Guadalupe Alvarez Brunel, owner of Penzi, a full service provider for destination weddings. I learned our wedding market is about 50-50 foreign to domestic with Americans outnumbering Canadians, and folks from Mexico City trumping those brides from other areas of Mexico. About half want mass in a church prior to the reception with the iconic Parroquia being a fan favorite. Then comes St. Francis, the Immaculate Conception Church (Las Monjas) and St. Anthony’s. Costs vary wildly depending on size, accommodations and such though normally it runs about one third the cost of a comparable wedding in the US, according to Guadalupe Alavez Brunel. Economic rewards for the local economy arrive for lodging, cakes and chair rentals all way down to my tiny world of walking tours, dance lessons and sales of my books on local history and culture. 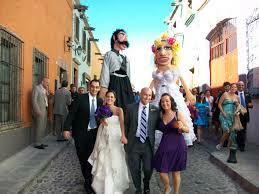 Where ever the guests’ interests lie, destination weddings are big business for virtually every business in town. Brides choose San Miguel for its inherent charm, romance and inability to take a bad shot when they desire several days with loved ones versus just the day of the wedding itself. Destination weddings are the ones you see that have the flower-strewn mule leading the way as the guests enjoy tequila shots and the dancing grace of the huge bride and groom papier-mâché puppets. Local weddings I’ve attended tend to be much larger with receptions held in local Party Halls or out in the country side where there is plenty of room for both the Lady Gaga sized concerts and seemingly endless supply of food. Recently was Day of the Innocents, or Mexican April Fool’s Day. If I play a trick on you and you catch me at it, I exclaim “Innocent” in honor of all the innocent baby boys King Herod killed because the joke was on him, Jesus escaped. Invited to a wedding on Day of Innocents for a Mexican couple, now in their 40’s that had dated since they were teens, I assumed it was all a hoax. I was wrong, it was a lovely wedding. Joke’s on me! 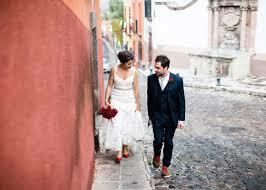 Following the travel, tequila shots and wedding day activities foreign guests are ready to call it a day. Following the ceremony the local wedding guest is right ready to cut loose until the wee hours. So much so, I often have seen wedding party members stocking up on tacos in the jardin knowing that following a wedding mass in the afternoon it may be a bit until the wedding reception meal. Living here, or visiting, being a wedding guest is always great fun! I’m assuming it is for the bride and groom also!